It's kind of another grab bag day on this Read Aloud Thursday. Nice and random, just the way Amy likes it! ;) We've been having lots of fun exploring our library. We went a lot during the first year of Bookworm1's life but then slacked off because I either couldn't remember to get the books back on time or else we were just too busy! (I DO tend to avoid the library during flu season because I've noticed the local moms are so desperate to get out of the house that they'll take their kids anywhere and in any condition.) But - before flu season really gets underway, we're having a grand time! For starters, the following book I picked up more because we have lots of friends who have lots of girls who like horses. I picked up two books in the Cowgirl Kate and Cocoa series because I wanted to see what they were all about. (I did not find the first book in the series so we went with two follow-up titles.) 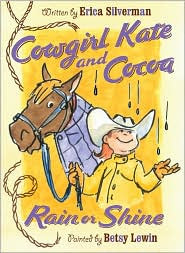 Of the two we read, Bookworm1 and I enjoyed Cowgirl Kate and Cocoa: Rain or Shine . These books, by Erica Silverman, are quite cute and clever. Silverman takes care to use real horse/ranch lingo and the stories revolve around a little girl and her best friend who just happens to be a horse. These two are tight. Cocoa greets Kate from her bedroom window in the morning. Kate rolls out of bed, hops out the window, gets on Cocoa's back and starts riding. (I know a few girls who would really like this idea...) The two check the hay bale supply and the fence posts. Then it begins to storm. Afterwards they have to gather apples that the wind vlew down and check the cornfield, etc. It's a very cute and clever book and I'm anxious to read the first title to see what it is like. The second title we picked up in this series was Cowgirl Kate and Cocoa: Horse in the House which I didn't care for as much because Cocoa is not allowed inside the house but insists with Kate's agreement that they disobey her parent's wishes and keep the horse outside. It wasn't so very overtly negative but still - I'm not really fond of books that highlight disobedience and I felt this title did that, more or less. Rain or Shine was much prefered and again, I'm really curious about the other titles. We've also been doing a bit of potty training around here. It has mostly occurred because Bookworm1 is motivated to obtain toy animals. (We're bribing him, yes, with Safari animals because he LOVES playing with them.) In light of our recent activities, we picked up a copy of No More Diapers for Ducky! . In this book Ducky comes over to Piggy's house to play. Upon arrival he discovers that Piggy is occupied on the toilet. Ducky bends to peer pressure and the declaration is, "No more diapers for ducky!" Out of all of the potty training books I have read, this is the least offensive and bothersome. I can't stand how detailed some books get and more frequently I just don't care for how such books refer to what is happening. No More Diapers for Ducky simply features two animals who are proud because they no longer have to wear diapers. THAT I can handle. Furthermore, it is illustrated by Sam Williams which I identified on spot because he illustrated one of my other favorite children's titles, Tumble Me Tumbily. Very cute and we like this one. Lastly, on a completely different note (har, har) Bookworm1 has really been interested in violins. When he finds two sticks they either become drum sticks or he starts rubbing them together, placing one under his chin and tells us to watch him as he plays the violin. I figured we might want to learn a little bit about this fine instrument so we picked up Violins . This book is simple and basic in the extreme. 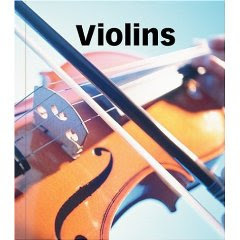 It contains everything that Bookworm1 loves - pictures and the names of the various parts of the violin. He enjoyed looking through this one and enjoyed the experience even more when we pulled out a REAL violin for him to play on. Oh my stars was that a fun time! I don't know how early one should really start a child on the violin (as soon as the parents' ears decide they can tolerate it?) but I hopefully anticipate some music being played in our home in the near future. Fun thoughts! This week I'd like to invite you to leave a suggestion for books you think we should check out from the library next. Then in two weeks, I'll let you know which ones we obtained from our library and read. Leave a comment below with a suggestion. We'll take it and see where it takes us! We love Cowboy kate and Cocoa! My daughter, Kate, received one as a birthday present. then we found two on audio CD at the library- that was fun listening. Oh, Carrie, this post is the epitome of randomness! I love it!!! Cowboy Kate and Cocoa is a series I've seen in audio at our library, but not as stand alone books. I think my girls have listened to an audiobook of it and enjoyed it. Violin--hmm. . . I think you could introduce it as soon as your ears can take it, for sure. My girls have been in music since they were less than two years old. Granted, for the first several years it's very repetitive and a lot about rhythm and fun, but I think they've learned a LOT. Lulu is playing the piano now! As for recommendations, I'll have to think about it and come up with something GOOD for you. . . I have to out Cowboy Kate and Cocoa on my Amazon list! WHY have not seen those? I played the violin for about 12 years, then I heard another homeschooler who had started the same time I did and his talent was so beautiful, I knew I would never have the beauty that I wanted so I quit. It is so important to find the right instrument for your children! I think my talent lies more in the drum or piano but I wouldn't know as I was never encourage to find my own music. I felt that since I failed at the violin I was to ever be a music lover but never a player. Now I sing, I might not be a good singer but I love it!